Why not enjoy the beauty and benefits of nature inside as well as outside? Adding a houseplant or two finishes a room, transforming it into a true living space. Bellevue Nursery has the best house plant collection in town! From African Violets to ZZ plants and everything in between, we will help you choose the best plants for your décor. Brown thumb? We will give you advice on successfully growing a “garden” indoors. Please see our House Plant Basics tip sheet for more information. 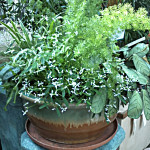 Group houseplants with similar needs together in a gorgeous pot to create beautiful indoor arrangements. They last longer than cut flowers! 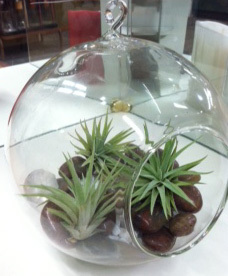 Tillandsias (aka Air Plants) provide a trendy contemporary look for home or office, even though they’ve been around for years. (Remember the 70’s terrariums and macrame pot hangers?) Because Tillandsias are small and do not require soil, they’re the perfect collectible plant for small spaces – even if you have a brown thumb. Lucky Bamboo has long been associated with the Eastern practice of Feng Shui – or the bringing of natural elements of water, fire, earth, wood and metal into balance within the environment. We just love it because it is elegantly simple and creates a strong vertical accent to any setting. Plus, these plants are very easy-care, as long as you keep the water clean and fresh. May good fortune smile upon you! 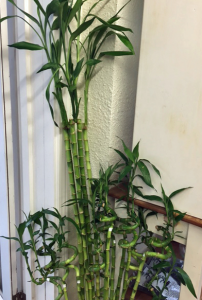 Houseplants are portable works of living art. Use broad-leafed plants to create instant drama or cluster several plants together as a tabletop arrangement. With the right container, you can shape the attitude of the room, whether it be cozy, classic or quirky. In addition to being a decorating and design element, houseplants have truly amazing health benefits. Not only does the presence of plants lower stress by promoting a calm and relaxed attitude, but research by NASA proves that plants are capable of cleaning indoor air of volatile organic chemicals. Please see our Top Green Cleaners tip sheet for more information.